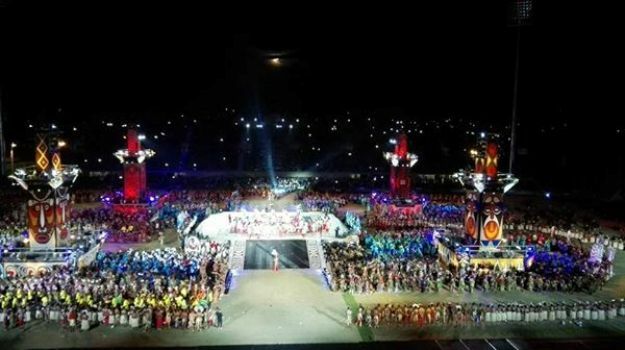 All 24 nations at the XV Pacific Games opening ceremony were cheered on as they stepped onto the main stage at Sir John Guise Stadium last night except for Fiji and New Zealand. PacNews reports both were cheered on and booed later and this has been attributed to negative reports shared on social media. Fiji is reported to have complained about the water at the Games Village and the New Zealand football team about the accommodation standards at the Games Village and are therefore staying at hotel. PNG Today has reported that Papua New Guineas, Water Company Eda Ranu CEO Henry Mokono refutes claims by Team Fiji about the water supplied to the games venues, by saying PNG’s water through Eda Ranu is best in the Pacific and rank 10th in the World standard. It’s the safest water to drink during Pacific games. He says the company delivers safe, quality water to residents every day in the city brushed aside negative comments made by the Team Fiji. Meanwhile,competition has officially begun at the 2015 Pacific Games in Papua New Guinea. Women’s Triathlon is currently underway with the first gold medal of the games on the line. The Fiji mens under 23 football side is playing Federated State of Micronesia with the Fijians leading 21-0 at half time. Christopher Wasasala scored 6 goals for the Fijians. Weightlifting competition also begins at this hour with Gold medals also up for grabs. The Fiji Womens Basketball team plays New Caledonia at 3pm while the Men’s team takes on hosts PNG at 9pm.